Twenty-first day/night of the London Blitz. "The enemy was very much more active during the day than usual. Three attacks were made on LONDON and some damage was done to the Southern Railway." On Friday 27th September 1940, previously suspended services between Northfield and Hounslow resumed at 08:52, and between Turnham Green and Richmond at 14:00. At 21:47, a 250kg High Explosive (HE) bomb hit the road of Haverstock Hill 100 yards (91 metres) north-west of Chalk Farm Northern line station, 32 feet (10 metres) directly above the southbound running tunnel. "Exceptionally few windows were broken and the clock was not even stopped in the station; the men in the control room experienced a heavy thus and the structure trembled, but they did not notice this particular bomb more than others in the neighbourhood." Segments were cracked in segments of thirteen rings of the northbound tunnel, while the southbound suffered fractures in twenty-three rings, with a 20 x 30 inch (50 x 70 cm) hole blown through one segment at waist height above the rail level. Services were initially suspended completely between Camden Town and Golders Green stations, but the damage in the northbound tunnel was judged to be of a level that would still allow the running of a full-length shuttle train service through it between Camden Town and Hampstead. The following day a bus service was instituted between Chalk Farm and Belsize park, with the stations only open for booking purposes. "All the engineers concerned were of the opinion that had this damage taken place under the River [Thames], water would have poured into the Tube at many places, and the Inspecting Officers agree." "It is clear that the additional depth of the tubes [at London Bridge] does not justify differentiation from the procedure agreed for the Charing Cross and Waterloo floodgates. The Inspecting Officers are not carrying out their normal functions in this respect. They are normally the Minister's technical advisers on all railway matters; but backed by their knowledge and experience of the last two years, they are in a better position than anyone else in this Ministry to advice the Minister upon the risks which should justifiably be taken in a matter of policy of this kind, and they have no-one upon whom their responsibility can devolve. It is easy to be wise after the event and say that a risk might safely have been taken after no bombs had fallen during any particular Red Warning; but this Ministry will be hard put to it to find an excuse if, after having spent many thousands of pounds towards making the Tube system safe for transport purposes, the floodgates which have been provided at London Bridge are not used, and the Tube system is flooded in consequence and put out of action for the rest of the war, not only for transport, but even as refuges, together with the almost inevitable loss of many thousands of lives." Damaged segments in the southbound tunnel were extensively replaced, whilst those in the northbound tunnel were merely reinforced, pending full replacement later (see plan below). Full services resumed on 7 October 1940. At 23:25 services between Uxbridge and Rusilip on the joint Metropolitan/Piccadilly line were suspended due to a reported HE on the track; normal working resumed at 00:20. Stockwell station on the Northern line was closed at 05:45 on the 28th due to a Delayed Action bomb in front of the station. Station re-opened by 18:00. Twentieth day/night of the London Blitz. An explosion in the air above West Hampstead Metropolitan/Bakerloo line station at 22:30 damaged glass in the station building, and injured one passenger. On the Piccadilly line, at Caledonian Road station, the roof and doors of Walters Road sub-station were damaged. At 23:15, Paddington (Praed Street) station was hit by Incendiary Bombs. Fires in the vicinity of Edgware Road station caused the suspension of Metropolitan line services between 00:15 and 00:40 on the 27th. The up line on Portobello Bridge carrying the Hammersmith & City line was damaged by a bomb at 01:50. On the District line, a girder fell across the eastbound track at South Ealing at 04:20, while services between Gunersby and and Richmond were suspended due to a Land Mine near Kew Gardens, and damage to Thames Road Bridge. A High Explosive (HE) bomb fell on the Piccadilly line track at Boston Manor at 05:16, displacing the current rail. Services suspended. An HE hit the car shed at the Northern line's Morden Depot, destroying an ambulance. Bakerloo line services between Paddington and Elephant & Castle suspended due to signal problems. Woodside Park to High Barnet closed. Tottenham Court Road, and Oxford CIrcus stations closed. All lines at Ealing Broadway closed. Earls Court station now open. Nineteenth day/night of the London Blitz. On Wednesday 25 September 1940, a suspected Delayed Action (DA) bomb on the track between Gunnersby and Kew Gardens suspended District line services between 09:07 and 10:25. A DA at Dagenham (now Dagenham East) at 09:16 suspended services between Barking and Upminster. Electric services between Barking and Dagenham, and steam services to Upminster, were resumed at 10:58, with full electric through services at 17:10. From 10:00, Tottenham Court Road station was open for interchange and exit only, with no booking facilities open. Northern line service between Strand (now Charing Cross) and Kennington were suspended from 12:20 to 12:53 for an inspection of the tunnel. On the Northern line, blast from a High Explosive (HE) bomb on the road outside damaged Oval station, while another damaged Colindale station at 20:45. Services between Archway and Woodside Park were suspended from 21:30 due to a current failure, and DAs between East Finchley and Finchley Central, and between Finchley Central and Woodside Park; services resumed between Archway and Finchley Central only at 01:03. An HE on the viaduct at Brent (now Brent Cross) station resulted in northbound services terminating at Hampstead between 11:03 and 11:34. At 23:45 a second HE at Colindale completely demolished the station, injuring a number of staff and passengers,, eight of them fatally. Edgware to Hendon services suspended. On the Richmond branch of the District line, damage to the Thames Road Bridge led to services being suspended between Kew Gardens and Gunnersby, while at 21:15, Incendiary Bombs (IBs) between Fishers Lane Bridge and Turnham Green station also affected services. IBs caused a fire at Chiswick sub-station, whilst elsewhere Goldhawk Road station and two arches of the viaduct were also set ablaze. Services suspended Edgware Road to Hammersmith, and resumed between Edgware Road and Ladbroke Grove at 07:10 on the 26th. On the joint District/Piccadilly line, the west signal box at West Kensington was damaged by a bomb, while fires under the arches damaged Stamford Brook station. Piccadilly line services suspended between Hammersmith and Hyde Park Corner. 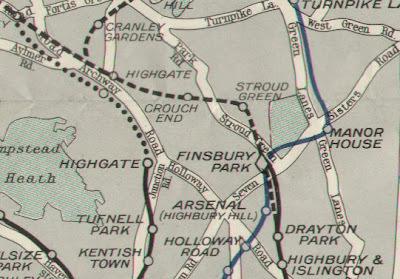 On the short Metropolitan line branch between Latimer Road and Addison Road (see map below), Uxbridge Road station - which stood on the site of the new Shepherd's Bush London Overground station - was damaged by an HE. Services on the branch suspended. The Metropolitan line as a whole suffered a total failure of current between 22:05 and 22:36. Closed Finchley Central to High Barnet, and Edgware to Hendon. Restricted services Hendon to Golders Green. No service Earls Court to Kensington, Ealing Broadway, or Richmond. Wimbledon to Upminster in operation. No service Hammersmith to Hyde Park Corner - damage at West Kensington. Addison Road to Latimer Road closed. Baker Street to Moorgate closed. Aylesbury to Baker Street in operation. Eighteenth day/night of the London Blitz. On Tuesday 24 September 1940, District line services suspended since the previous day were resumed between Charing Cross (now Embankment) and Mansion House at 10:05, and between St James's Park and Charing Cross (now Embankment) at 18:15. Services between Earl's Court and Putney Bridge, suspended since 12 September, resumed at 19:50. Metropolitan line services through Swiss Cottage station - closed due to a Delayed Action (DA) bomb (see yesterday) - resumed at 15:42, but another DA was discovered at 16:58, and services between Baker Street and Wembley Park suspended until 18:45. Piccadilly line services between Wood Green and Cockfosters, suspended since 18 September, resumed at 17:30. Debris on the track between West Kingsington and Barons Court damaged two Piccadilly line trains (broken side springs). High Explosive (HE) bombs again hit Earl's Court District/Piccadilly line station at 21:30, with debris injuring three passengers and two staff. The station was closed, although District line services between there and Parson's Green resumed at 07:00 on the 25th. District line services between East Ham and Upminster were suspended at 21:30 due to an incident at Upminster. 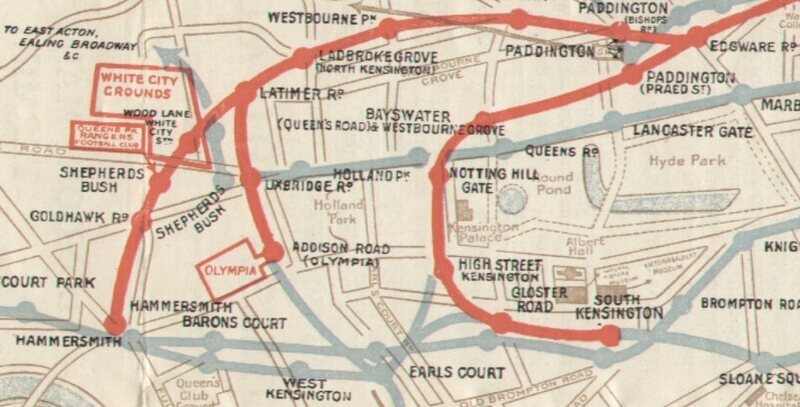 At 21:58 Incendiary Bombs fell on the track at South Kensington station; District line services suspended between South Kensington and Acton Town, and Piccadilly line services between Hyde Park Corner and Acton Town. Metropolitan line services were suspended due to an Unexploded Bomb at Finchley Road. At 22:00, a bomb hit a buiding on the corner of Hanway Street and Tottenham Court Road, north of the station of the same name and directly above the Northern line, but the tunnel was not damaged. At Morden, a faling anti-aircraft shell damaged electrical cables; current switched off between 01:11 and 01:22. An HE on the track at Northfields Depot at 01:12 on the 25th damaged three roads. At 03:30, Mile End station was also hit by HEs, while one outside Blackfriars station damaged the roof, and left the ceiling in a dangerous condition. Services through Blackfriars resumed at 08:40. Ealing Broadway, Richmond, and Hounslow West to Charing Cross (now Embankment) reversing. Dagenham (now Dagenham East) to Mansion House reversing. No service between Baker Street and Moorgate. Piccadilly, Bakerloo, and Hammersmith & City lines normal. Sixteenth day/night of the London Blitz. Two trains collided on the southbound platform at Queen's Park station on the Bakerloo. Two trains were damaged, and services were suspended between Kensal Green and Queen's Park southbound only. At Plaistow on the District line, a car overturned at 23:25. Fifteenth day/night of the London Blitz. Metropolitan line services between Baker Street and Edgware Road resumed at 09:30 on Saturday 21 September 1940, while those on the Northern line between Golder's Green and Brent (now Brent Cross) resumed at 12:00. Services reversed at Putney Bridge due to Delayed Action bomb (DA) at the west end of Parson's Green station on the District line, and at Woodside Park on the Northern line due to a DA a quarter-mile (800 metres) north of the station. Thirteenth day/night of the London Blitz. On Thursday 19th September 1940, a Delayed Action bomb (DA) between Wembley Park and West Hampstead suspended the Bakerloo /Metropolitan line from 10:05 to 10:45. District line services between Bromley-by-Bow and Barking stations were suspended between 10:38 and 11:00, after which they initially resumed without stopping at Plaistow station, which reopened at 14:02. Earl's Court station reopened after being closed on the 13th, while Hammersmith & City line services between Hammersmith and Ladbroke Grove station resumed, having been suspended since the 17th. No Piccadilly line services between Wood Green and Cockfosters due to bomb crater in track, while Russell Square station was closed due to a nearby DA. The Metropolitan line was closed between Baker Street and Edgware Road stations due to a DA, and between Euston Square and Mooraget due to tunnel bomb damage the previous night, and unsafe buildings at Moorgate. Central line services between Wood Lane and Queens Road (now Queensway) stations were suspended until 08:00 on the 20th, while the East London line remained closed due to bomb damage at Surrey Docks (now Surrey Quays). No service Wood Green to Cockfosters - crater in track between Arnos Grove and Cockfosters. Russell Square station closed - UXB in vicinity. Baker Street - UXB between Baker Street and Egware Road. Euston Squre - bomb through tunnel roof. No service Egware Road to Moorgate - unsafe buildings at Farringdon Street station due to fires in vicinity. No Service Wood Lane to Queen's Road - bomb at Wood Lane station at 08:05, traffic resumed by 09:00. Line closed - damage to tunnel and track at Surrey Docks station (09/09). Twelfth day/night of the London Blitz, on which there was heavy disruption due to Delayed Action (DA) bombs on or in the vicinity of tracks, stations, or other infrastructure. On Wednesday 18 September 1940 services were suspended between Baker Street and Edgware Road stations, while Russell Square and Great Portland stations were closed, although the latter re-opened at 11:10. An unexploded Parachute Mine also closed Shoreditch station on the East London Line. A suspected Unexploded bomb (UXB) - probably a Delayed Action, but possibly an unexploded anti-aircraft shell - was reported at the Metropolitan line's Neasden Depot, between number 8 and 9 roads. After the disruption of the previous night, Regent's Park station re-opened at 11:15, while the Central line resumed running between Bond Street and Liverpool Street at 11:30, and a shuttle service between Wood Lane and Ealing Broadway commenced at 17:40. Marble Arch station re-opened at 19:12, having been closed since the explosion of the previous day. At 19:58 there was more disruption at Neasden Depot, when a bomb hit number 5 road, damaging five trains. Current was switched off at 21:00. The ticket hall at Ravenscourt Park station was damaged by a bomb on the track at 22:23. At 22:37 Acton Road Junction on the District line was bombed, and services to Richmond suspended. Also on the District line, a bomb hit the Cromwell Curve between Gloucester Road and High Street Kensington at 23:47, badly damaging the track and a signalbox, and severed the No. 63 feeder to Mansion House. Two signalmen were hospitalised. Piccadilly line services between Acton Town and South Ealing were suspended from 23:10 and 23:37 due to a DA, whilst another was reported at West Brompton at 00:43 on the 19th. A third DA on the line, at Alperton station, suspended services between Ealing Common and South Harrow from 08:15 to 09:44. At 01:00 a bomb hit the junction of Camden Road and Kentish Town Road, almost directly over the Northern line tunnels north of Kentish Town station, but did not damage the tunnels, which are 15 yards (12 metres) below ground at this point. At 01:15 the junction of Seaton Place and Hamsptead Road, directly above the Northern linebetween Warren Street and Euston stations, was also hit, but again the explosion did not damage the tunnels, 24 yards (22 metres) down. A bomb through the tunnel roof at Euston Square station at 01:20. Two permanent way men were killed, and passengers on a train were injured by flying glass. The contemporary plan below shows the point of impact of the bomb, designated "S/P4." At 05:30, a High Explosive bomb blocked the Piccadilly line track 100 yards (91 metres) North of Arnos Grove station; trains reversed at Wood Green. No service Parsons Green to Earls Court - UXB at West Brompton. No service West Kensington to South Kensington - bomb damage on Cromwell Curve. No service Wood Green to Cockfosters - crater on track between Arnos Grove and Cockfosters. No service Edgware Road to Moorgate - unsafe buildings between Kings Cross and Moorgate, and bomb damage between Esuton Square and Great Portland Street (19/09 and previously). No service Ealing Broadway to Queen's Road (now Queensway) - bomb damage at Wood Lane, and UXBs at Ducane Road and Shepherd's Bush. Oxford Circus interchange traffic only - debris in Oxford Street. A naval mine re-purposed for use on land. Inter-service demarcation dictated that they had to be defused by Royal Navy personnel, rather than the army, who were responsible for dealing with conventional bombs. Eleventh day/night of the London Blitz. High Barnet station was closed on Tuesday 17 September 1940 due to a Delayed Action bomb (DA) in the sidings, while another outside Baker Street station closed it except for interchange traffic. Regent's Park station on the Bakerloo line closed at 14:35 due to the risk of flooding. Over the course of the night, the Metropolitan/Hammersmith & City line's Bow Road Goods Yard (Arnold Road, Bromley) was hit with multiple High Explosive (HE) bombs, rendering some of the track unusable. At 01:40 on the 18th, a bomb breached the tunnel between Great Portland Street and Baker Street station, landing by the track, but failed to explode. At 21:35, the Hammersmith & City line Wood Lane station was hit by Incendiary Bombs. At the same time, a DA was reported on the track between Shepherd's Bush (now Shepherd's Bush Market) and Latimer Road stations, and another in the vicinity of the Shepherd's Bush sub-station. Services were suspended between Hammersmith and Ladbroke Grove. At 21:55, the nearby Central line Wood Lane Depot was hit by a HE bomb or bombs, damaging the Yard Master's office and the Trainmen's Room, as well as the high-tension cable from Lots Road power station. A signalman, a lineman, and a clerk were hospitalised. Also on the Central line, bombs hitting the road outside Marble Arch station at 23:55 wrecked the subway, and severly damaged the ticket hall. The Central line as a whole was shut down at 22:10. The Marble Arch incident raises questions in relation to the records of the Commonwealth War Graves Commission (CWGC), which show one fatality - Abraham Rothberg (29), of Bethnal Green - "at Marble Arch Subway," with a second person - Dorothy Esther Jessie Bennett (19), or London, WC2 - dying in hospital on 22 September having been, "injured 18 September 1940, at Marble Arch Subway." The latter dating of the 18th rather than the 17th can easily be explained by the incident ocurring so close to midnight. In addition, however, the CWGC records fourteen other people - nine men and five women - being killed, "at Marble Arch Subway," on 16 September, a date on which there is no damage to the station recorded. It is possible that that they died in the pedestrian subway under Park Lane near to the Marble Arch itself, and that the subsequent casualties at the Underground station were linked in error ("subway" is used to describe pedestrian tunnels in the UK, but rarely Underground stations). At 01:45 on the 18th, DAs breached the Circle line at Baker Street, damaging the track, but repairs were effected by 06:00. In the meanwime services between Finchley Road and Baker Street, and Baker Street and Kings Cross, were suspended. The Metropolitan line bridge over Uxbridge Road, Sherpherd's Bush, was reported unsafe due to HEs at 04:45. Parsons Green to High Street Kensington - UXB at West Brompton, difficult to reach. No electric servide from Mansion House beyond Bromley. No service Finchley Road to Moorgate (UXB near Baker Street), Edgware Road to Baker Street, Hammersmith to Latimer Road [Hammersmith & City]. Widened line open for freight. Entirely closed - damage to Shepherds Bush sub-station and Marble Arch Station. No service Totteridge to High Barnet. Disused station situated at location between the current Shepherd's Bush and White City stations. Eighth day/night of the London Blitz. At 11:25 on the 13th, West Brompton station was again (see previous day here) affected, when a High Explosive bomb landed in the adjacent Brompton Cemetery, causing a retaining wall to collapse across the tracks, damaging electrical cabling. 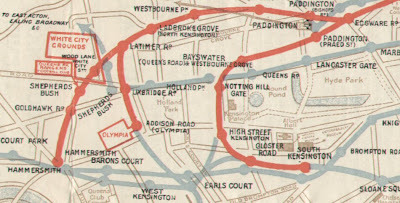 Delayed action or unexploded bombs dropped in the vicinity of Queen Anne's Mansions (requisitioned by the Admiralty) in Westminster caused the precautionary suspension of District line traffic through St James's Park station. Sixth day/night of the London Blitz. At 23:10 on the 12th, a High Explosive bomb landed in the vicinity of West Brompton station on the Metropolitan line, causing a water tower to collapse, temporarily blocking the tracks. Fifth day/night of the London Blitz. At 01:24 on the 12th, two bombs straddled the Metropolitan line tracks between Uxbridge and Ruislip, but did not explode. District line traffic was suspended when a High Explosive bomb breached the running tunnel between Blackfriars and Mansion House stations at 03:10, but it also failed to detonate. Second day/night of the London Blitz. Enemy activity during the day was, "intermittent, with no apparent object in view," but from 19:45 until around 05:00 the next morning, the capital again came under concentrated attack - "particular attention was paid to communications, i.e. railways, roads, etc." At 23:06 High Explosive (HE) and Incendiary Bombs fell on Wimbledon station, setting an arriving District line train on fire. Just south of Mornington Crescent station, a cluster of three 250kg HEs landed on the junction of Harrington Square and Hampstead Road at 03:35, cratering the roadway. At this location the Northern line runs 60-75 feet (18-23 metres) directly under Hampstead Road, and the shockwaves from the bombs shook tunnel segments, knocked cables off the wall hangers, and displaced the current rails in both tunnels for a length of 75 feet (23 metres). Traffic resumed on 11 September. At 04:39 an HE hit Bow Road station on the East London line, blocking the track. The first day/night of the London Blitz. "Practically the whole of the enemy effort during the last 24 hours was devoted to the attack on LONDON, with an acute concentration of the DOCK AREAS, RAILWAYS and POWER STATIONS." Approximately twenty-four railway stations were hit in the south and east of the capital, including those on the London underground network. At around 19:00, Blackfriars District/Circle line station was hit by a High Explosive (HE) bomb, knocking out the signalling and leaving traffic, "practically at a standstill." New Cross Gate station was hit by five HEs, injuring two Southern Railway workers, one of whom - 43 year-old engine driver Richard James Shelton of Catford - died in St Giles' Hospital the following day. Five year old George Turner of Forest Gate was killed at East Ham station on the District line.